By clicking on the link "Manage responses" in the Menu box, you get a list of all the responses for the current survey. From this list there are links to each response (click on the respondent id), a column for reopening and sending the survey link to one or more recipients, and checkboxes for deleting responses. To reopen and send the survey link each respondent must have a valid email address. Some email fields have email address already set, this is because the respondent has been invited to take the survey through an email invitation. 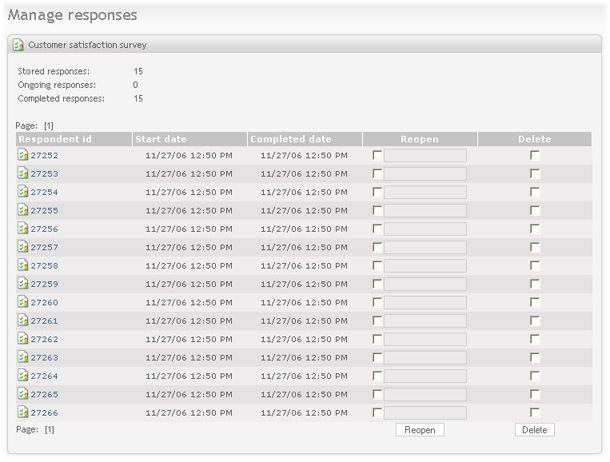 The two buttons at the bottom of the list will respectively reopen and resend, or delete the selected respondents. Multiple filters can be added, but only one per type (one filter for email, for example). Filter type of type "Completed" or "Not completed" does not include a text field for search term. It is of type on/off, and they can't both be added. If you have a filter for "completed", and add a filter for "not completed", the filter for "completed" will automatically be cancelled (and vice versa). The date filter type has two fields; one for start date and one for end date. In other words, the date filter can filter on a date range. When clicking on one of the fields, you will get a date-picker for more quickly entering a date and time. Existing filters can be deleted and deactivated by clicking on the "x" for the filter. The invitee list will automatically be updated according to the deleted filter. Filters are stored as cookies in the browser, and expires and will be removed within 5 days. They will not be available if you use another browser or computer. To make use of the reopen/resend functionality, the logged in user has to be registered with both user name and email. Also, the email language will be the logged-in user's selected language.